I’ve been hanging onto this book for a while. As it’s a spooky story, I meant to read it last October in the spirit of Halloween, but forgot, so I saved it for this October. 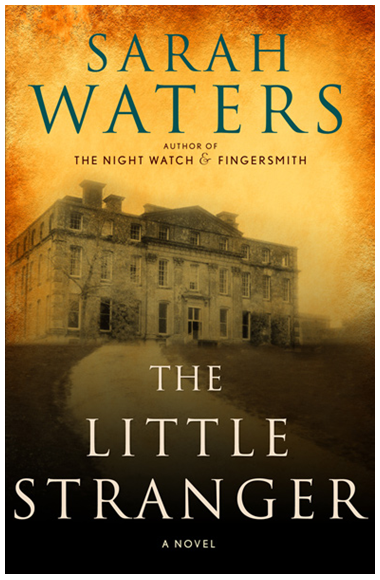 I’ve read two other novels by Sarah Waters – Tipping the Velvet and Fingersmith – and so loved both of those that I looked forward to The Little Stranger with great anticipation. Unfortunately, I must admit that I was disappointed. Set in post-WWII England, the story is narrated by Dr. Faraday, a middle-aged bachelor and country doctor from humble, working-class roots. In his childhood, the county was still enthralled with Hundreds Hall, a majestic estate dating back to the 1700s and inhabited by the well-to-do, aristocratic Ayres family. The story opens with Dr. Faraday recalling a community event at Hundreds Hall when he was ten years old, and how shortly afterwards, tragedy struck the Ayres family and they retired from public life. Over the next three decades, the mostly reclusive Ayres family loses its fortune and Hundreds Hall itself falls into disrepair and decline. One spring day nearly thirty years after his one childhood visit to Hundreds Hall, Dr. Faraday is called out to the estate to treat an ailing housemaid, who is really just frightened by the old, lonely house and is convinced that it’s haunted. Brushing off the girl’s rantings as silly nonsense, Dr. Faraday begins visiting the estate regularly and becomes quite entangled with what remains of the family: the aging Mrs. Ayres, and her adult children, Caroline and Roderick. His growing involvement with the family begins as their family doctor, and evolves into family friend, and finally he becomes romantically involved with Caroline. Over the course of not quite a year, the house continues its decline and strange things begin happening. Always intent on remaining rational, Dr. Faraday comes up with an explanation for every weird thing that happens, and inevitably, things take a sinister turn. The family is convinced that the house itself is “infected,” and out to get them – that some malevolent force is at work and intent on destroying the family. It’s an interesting story, but I felt very much that it lacked the brilliant plot lines Waters crafted in Tipping the Velvet and Fingersmith. It dragged quite a bit; the story didn’t really become compelling to me until about two-thirds of the way through, and even then, I was left feeling unsatisfied when I turned the last page. Also, Dr. Faraday himself is not an extremely likeable character. I was often annoyed at him; maybe the reader is meant to be, I’m not sure. There is no doubt that Waters has an exceptional gift for prose, but I didn’t feel that this story showcased what she’s really capable of. It’s Holly. I just finished her new book, The Paying Guests (or something like that). I really loved Tipping the Velvet, but Fingersmith is without doubt her best work. The new book is not in the same league as these two. It’s more like the book you describe above. Never really compelling. If after this little micro review you’d still like to lay your hands on a copy of it, I’m happy to mail you mine. Hardcover and all. Hi Holly! If you want to mail your copy of The Paying Guests to me, I wouldn’t refuse it 😉 Otherwise, I would probably just end up downloading it to my iPad at some point. As it is, I don’t know when I’ll get to it, as I have abut a thousand other books on my to-read shelves. Did you like Affinity or The Night Watch? I haven’t read either of those. What other authors do you like? Just curious.